Clumber also fails vet check! 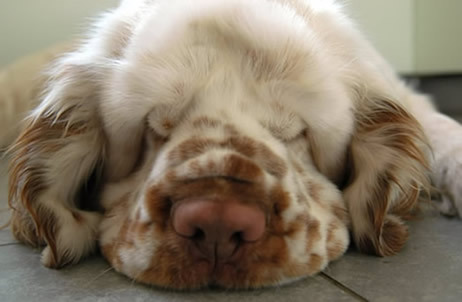 Recumbent Clumber spaniel. Note the excess skin covering the eyes. NB: This is not the dog that got scratched from Crufts today. Please read this caption before commenting. No dog representing the Clumber Spaniel breed will compete in Friday evening’s Best in Group competition at Crufts after it failed the new veterinary check that has been introduced to the show. The Best of Breed award was not given to Clumber Spaniel, Chervood Snowsun, following its veterinary check, which was carried out by an independent veterinary surgeon. This means that it will not be allowed to continue into the Gundog Best in Group competition. The Kennel Club has introduced veterinary checks for the Best of Breed winners at all Kennel Club licensed General and Group Championship Dog Shows from Crufts 2012 onwards, in 15 designated high profile breeds. This measure was introduced to ensure that Best of Breed awards are not given to any dogs that show visible signs of problems due to conditions that affect their health or welfare. Jemima Harrison has some pics of the dog on her blog. Can we guess why she was scratched? Jemima thinks it’s ectropion, and I have to say that’s probably the best bet. This dog had several health clearance and has some gun dog qualifications. My guess is that she is working on her Show Gundog Working Certificate, which she must have in order to be considered a full champion in the Kennel Club’s system. Qualzucht wins big at Westminster. The bulldog and Peke people are not amused. Imagine spending 200K on “campaigning” a dog (not for ribbons,of course) and then to have it DQ’d !!!! … and I am sure this breeder is concerned about rescue dogs … cause he now has one! As i’ve said here once before, breeding for eyes like that is particlulary cruel for a flushing spaniel. Eye haw, (while not ectropion) is required of clumbers. Imagine being sent into thick brush after birds with excess, sensitive, exposed moist tissue on your face, which collects debris like crazy. there is a reason gun dog people want tight eyes. Solution to this dilemna (a dog with scads of certificates geting DQ’d at Crufts) is simple really – campaign to have the breed shown in a different group!! … like, Non-Sporting – or Toy. I suggested this for Sussex spaniels, and you’d be shocked at the amount of poo that got thrown at me! Imagine being the judges that put those dogs up! These DQ’s look as though they are aimed at the particular breed judges that should know better. It is definatly the KC’s way of telling it’s breed registries to shape up. The judges show career is at stake here too! I would hate to have to judge an at risk breed tomorrow!